The initial results of NeKSAP district food security network (DFSN) meetings held in 74 districts in July 2016 and validated in five regional debriefing meetings in August 2016. 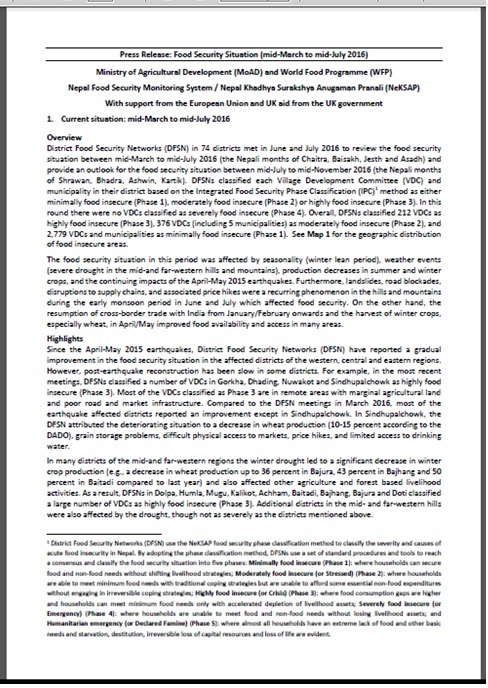 DFSNs analyzed the food security situation during the period of mid-March 2016 to mid-July 2016. 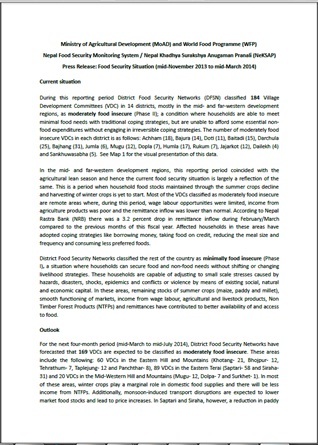 The full results will be published in the Nepal Food Security Bulletin (Issue 48). KATHMANDU – The European Union (EU) and United Nations World Food Programme (WFP) have today handed over a crucial food security monitoring system to the Government of Nepal. 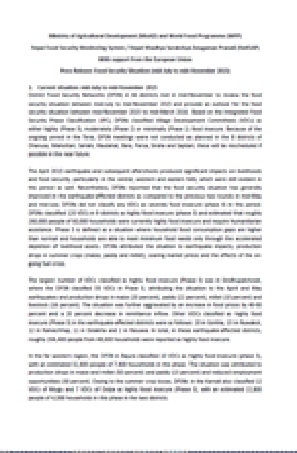 District Food Security Networks (DFSN) in 66 districts met in mid-November to review the food security situation between mid-July to mid-November 2015 and provide an outlook for the food security situation between mid-November 2015 to mid-March 2016. Based on the Integrated Food Security Phase Classification (IPC), DFSNs classified Village Development Committees (VDCs) as either highly (Phase 3), moderately (Phase 2) or minimally (Phase 1) food insecure. Because of the ongoing unrest in the Terai, DFSN meetings were not conducted as planned in the 8 districts of Dhanusa, Mahottari, Sarlahi, Rautahat, Bara, Parsa, Siraha and Saptari; these will be rescheduled if possible in the near future. Food insecurity and malnutrition among children are common in Nepal. Continuous monitoring of nutrition indicators, such as underweight among children less than 5 years of age, is essential for tracking the progress of the country in achieving the MDG targets (specifically MDG1: the eradication of extreme poverty and hunger). Nepal is a signatory to the United Nations Millennium Declaration and its eight Millennium Development Goals (MDGs). Continuous monitoring of nutrition indicators, such as underweight among children less than 5 years of age, is essential for tracking the progress of the country in achieving the MDG targets (specifically MDG1: the eradication of extreme poverty and hunger). 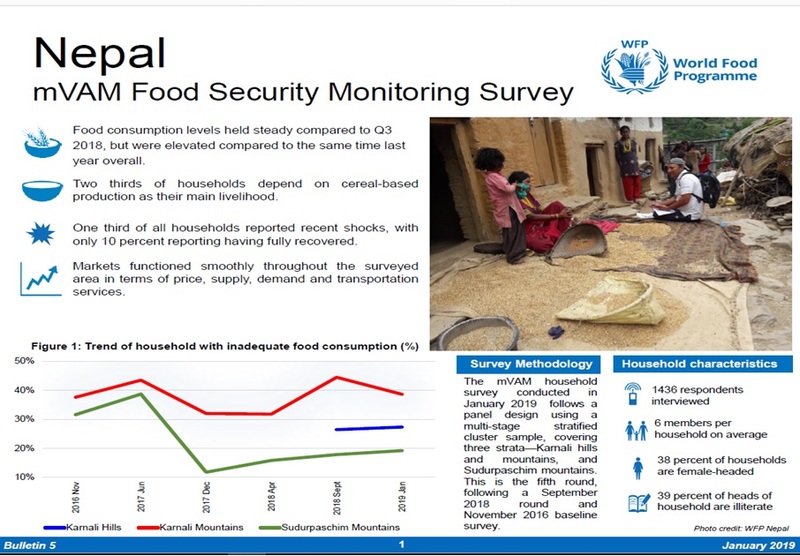 To address this issue, the World Food Programme (WFP) and Helen Keller International (HKI) have taken the joint initiative to include nutrition information as part of the Nepal Food Security Monitoring System (NeKSAP). Nepal is a signatory to the United Nations Millennium Declaration and its eight Millennium Development Goals (MDGs). Continuous monitoring of nutrition indicators, such as underweight among children less than 5 years of age, is essential for tracking the progress of the country in achieving the MDG targets (specifically MDG1: the eradication of extreme poverty and hunger). The monitoring mechanism assessing the impacts of the food, fuel and financial (3F) crisis on children's education in Nepal is facilitated by RIDA1 with support from UNICEF and in coordination with the Department of Education, District Education Offices, and schools. Monitoring takes place at three levels. In Nepal 3.7 million people are currently food insecure and each year an average of 1,000 are killed in natural disasters. In the south of the country 100,000 displaced flood victims returned home this year, while in the north tens of thousands left their infertile land to find work abroad. During the past 18 months the price of staple commodities has increased by up to 30 – 70 percent, and the government-owned oil corporation almost went bankrupt trying to maintain subsidized fuel costs. The nation is hundreds of housands of tons food deficit following two of the worst winter droughts on record and a summer marred by late and erratic rainfall. In the capital city,power outages and water shortages are a daily occurrence. The monitoring mechanism assessing the impacts of the food, fuel and financial (3F) crisis on children's education in Nepal is facilitated by RIDA with support from UNICEF and in coordination with the Department of Education, District Education Offices, and schools. Monitoring takes place at three levels. UNICEF, in coordination with the Department of Education and in partnership with Research Inputs and Development Action (RIDA), developed a monitoring mechanism to assess the consequences of the food, fuel and financial (3F) crisis on children’s education. This first quarterly monitoring report presents the findings from the first monitoring cycle (April to June 2009). 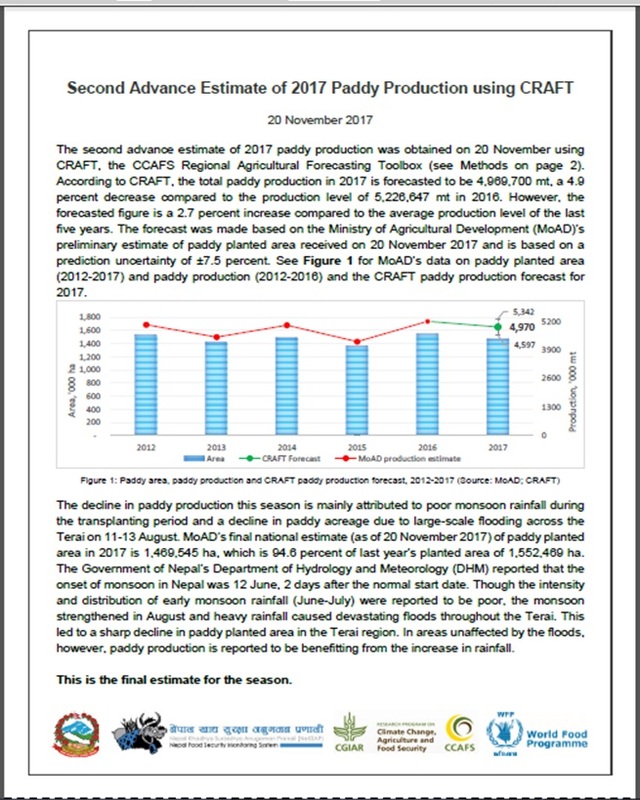 Most of Nepal has not received any rain since the sowing of the main winter crops of wheat and barley in November and December 2008. The overall impact of lack of rainfall on crop production has been severe. Contrary to popular expectation, since the signing of a national peace agreement in 2006, and Nepal’s first democratic elections as a republic in 2008, social and political unrest in the form of bandhs and politically motivated labour strikes have not only continued, but intensified. As a strike wave sweeps across the country, it appears that neither government appeal nor political party agreement to curb such action, has had significant affect; particularly as government affiliated organisations continue to facilitate these damaging activities. Last monsoon a large number of Terai districts were severely affected by one of the worst floods the country had experienced in a decade. 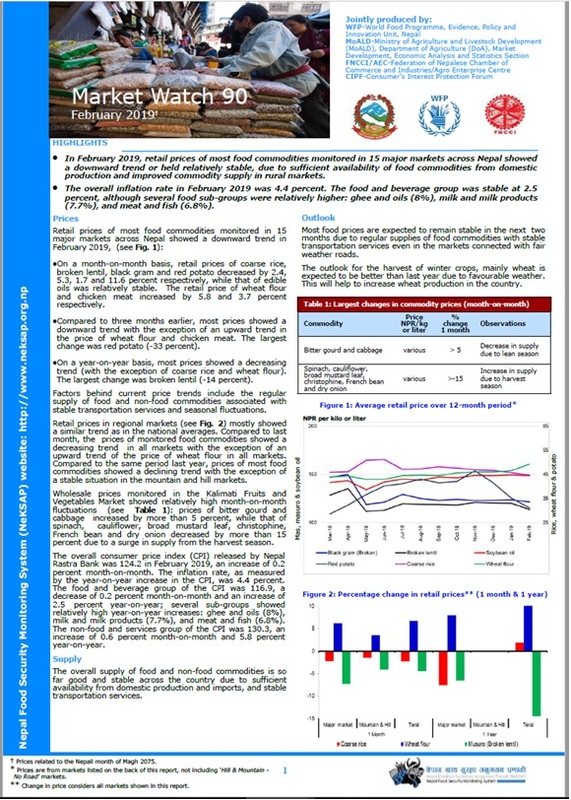 A rapid inter-agency flood assessment (WFP,UNICEF and SC Alliance) was conducted in the second-half of August leading to an emergency response where WFP distributed2,365 Mt of rice, 364 Mt of pulses, 154 Mt of vegetable oil and 46 Mt of salt to almost 200,000 beneficiaries in 12 of the worst affected districts. Since the paddy crop failure of last summer in Saptari and Siraha, the food security situation for many poor households in these two districts in the Eastern Terai remains precarious. The current floods across the Terai have affected many parts of Saptari and Siraha exacerbating the situation. In January 2007, WFP initiated are targeting exercise to support the extension of WFP’s emergency operation (EMOP) to provide assistance to drought-affected populations in Mid-and Far-Western Nepal. Seven district-level consultations were conducted where stakeholders identified and prioritized the communities in most need of food aid.